Big Sky Country is surprisingly green—and it’s not just the foliage. At the turn of the 20th century, Butte boasted a higher percentage of an Irish population than any city in America. These concentrations of Irish communities sculpted neighborhoods into genuine homes-away-from-home. So, where to go on St. Patty’s Day? Definitely a pub, absolutely parade, and without question a Celtic fair. Below are the top 12 spots in Montana to enjoy Guinness, Gaelic and green-tinted libations. Being the mecca of Irish-dom in Montana, the parade in Butte is a requisite notch in one’s holiday green belt. Starting in “uptown,” events commence around midday, passing through downtown before culminating in a street festival of live music, food and dancing amidst a sea of green. The festivities attract over 30,000 thirsty fun-seekers from around the world. Maloney’s is the classic local dive bar, except it’s got good, cold beer and an Irish-pub residue that’s long settled into the floorboards. The bar is what one does (and should) expect from a small-town, Western-esque watering hole: It’s usually loud, laid-back and local, completely devoid of unneeded decorations, garnishes or trinkets. Simply come for a beer, and stay for the conversation. As he sipped a beer and observed his surroundings, Jack Kerouac remarked in the March 1970 issue of Esquire that M&M was “the end of my quest for an ideal bar.” Still bearing the “cigar store” moniker residual of the prohibition era, M&M has not only survived two world wars and economic downturns, it’s longevity is encapsulated by the fact that its doors have remained unlocked since 1890. So, 24/7, this cigar store provides a pleasing historic veil to any night, or day, of drinking. This pub is an ideal representation of the American-Irish pub. It’s a very fun, polished place for the holiday. The beautiful, historical-downtown brick building encloses the bronze bar poles, dark woods and green felt of an Irish pub. A great food menu of authentic pub classics and modern embellishments absorb just enough alcohol to ensure a long and enjoyable St Patty’s. Sitting on the first official plot of “Butte City,” the Silver Dollar is another welcoming dive bar. No-B.S. bartenders greet visitors as they settle-in to the glow of a neon “Butte” sign hung on an adjacent wall. Silver Dollar is your more traditional western bar—sans the country music—a lone pool table, trinkets on the walls, and a prevalence of wood, noise and no-nonsense. Other than the laid-back atmosphere, the highlights of this venue are cheap drinks and a decent stage for live music. 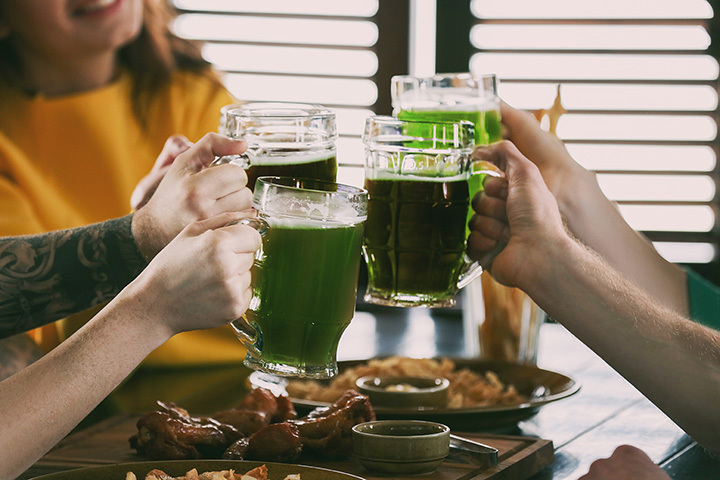 On St. Paddy’s Day, many drink, a few exercise, even fewer do both. For those with a runner’s spirit, Bozeman hosts a 10K or half marathon, ending with beers and a post-race Irish celebration. Even if lengthy periods of exercise aren’t you’re thing, don’t fear. The run is approachable for beginners as it’s mostly downhill, racers are fun and casual, and registration includes a technical race shirt, a unique finishing medal/bottle opener, a Run to the Pub pint glass, a RttP themed buff, one free beer (for those of age), a great after-party, and four, yes, FOUR chances to win an all-inclusive trip to Dublin, Ireland AND an entry into the Dublin Marathon. Proceeds go to a local nonprofit. Casey's is a good bar. Really good. It's clean, modern, multi-leveled, has great drinks and great food. And St. Patrick's Day is a blast: $10 corned beef dinner, green beer, live music on a quality sound system, and specials on Irish car bombs and cocktails galore. Expect a pleasurably-raucous bunch of green-lipped partygoers. Perhaps one is seeking a much mellower but similarly authentic St. Patrick’s Day. March to the chapter of the local Elks Club, which hosts an annual Irish celebration. The evening begins with a small parade through downtown Red Lodge, ending at the Lodge for dinner, drinks and entertainment. There’s live music (including bagpipes), green beer and the ubiquitous—and necessary!—corned beef & cabbage. Obviously, Hooligan’s is the spot for football season—it has every sports channel imaginable and the boasts the largest big screen in the state. But it’s also a great spot for St. Patty’s day food and drink. A traditional-ish pub sign bearing two lions hangs over the door, beckoning towards the long, sleek bar that stylizes the space. Though more polished than an authentic pub, the corned beef, food specials and plethora of TVs make Hooligan’s a really fun holiday spot. This 32-year-old Irish tradition is a real sight large floats and a kaleidoscope of traditional music and dance parade down the main drag. The street fills with food vendors and entertainment smells and tunes of Emerald Isle nostalgia and the spectacle keeps young and old entertained throughout the early afternoon. Once full on local treats and not-so-local brews, walk the town and happen-upon another St. Paddy's celebration.